Our pet overnight stays are a great option for when you are going out town for an extended period of time. We understand that leaving your dog at home is often not an option if you don’t have someone to care for him or her. The advantages of dog boarding are well worthwhile, including a safe living environment and that they will receive the care and attention they need. When your dog stays with us they are treated like part of the family. Our dog trainers and staff care for each and every one of the dogs that stay with us like they are their own. We understand that while you’re away, you want to know that your dog is in safe and capable hands. With experienced and knowledgeable staff on the premises 24 hours, your dog will have constant attention and security you need for your peace of mind. You are able to bring your dog’s own toys, bedding and food, so that they are more comfortable with their familiar belongings. We do not charge extra for feedings and medication. If you are trying to determine which type of boarding to choose, take a look at these three options below. If you have a dog that is timid or hasn’t been socialized, a kennel may be the best option. Often, dogs that get anxiety from being around other dogs for longer periods of time are better off in a kennel. With this option your dog has the opportunity to play in our doggy day care all day or leave their kennel crate 3-4 times a day to play with his or her own personal pet handler. This option is good for dogs that do not do well in kennels. They will be able to play in the doggy day care all day and at night have a private room with their own personal bed or blankets. Do you have a very social dog that gets lonely or anxious without company or attention? This option is good for dogs who enjoy being with other dogs throughout their stay. 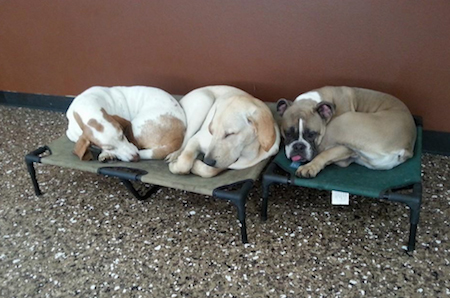 They will have all day in the doggy day care and sleep in a room with up to 5 other dogs. How Do You Know If Dog Boarding Is Right For Your Dog? We often receive a lot of questions about overnight stays. Take a look below at some frequently asked questions so you can learn more about whether or not this service is for you. How are the dogs separated? They are separated by age, temperament and the size. Will my dog need grooming after they stay? This depends on whom your dog is playing with and how much they’re playing. We recommend that they go in for an exit bath at the end of their stay. Does my dog have to come in for a temperament test? Yes, they do. Why isn’t the second dog free or half off? If you are admitting two dogs then we are taking care of two dogs not just one. We pay attention to each and every dog specifically. We take the utmost precaution to ensure that all dogs accepted in our overnight boarding are healthy and up-to-date with any necessary shots and vaccines. This grants owners the peace of mind that your dog is in a safe environment with a decreased risk of getting sick. We require forms to be filled out before your dog stays with us to make sure that we are doing our best to keep our doggy day care a happy, comfortable and secure atmosphere. We are happy to provide a safe and comfortable environment for your dog and hope you have a better understanding of how our overnight stays look. As always, we would happy to answer any questions you may have.